I have to admit, there wasn't a research image for this one. This TV dinner came mostly from the memories of the rare evening when my brother and I were allowed to have microwavable TV dinners. Black plastic compartments separated our chicken nuggets from our crinkle fries, and a thin layer of plastic covered the greatest of the treasure, a sticky 'chocolate' brownie that baked in the microwave. What luxury technology had brought to our lives! This TV dinner was for our production of Almost, Maine, and was simply a piece of set dressing. I decided that this character seemed like the tuna noodle casserole type to me, and what goes better with tuna noodles than peas? 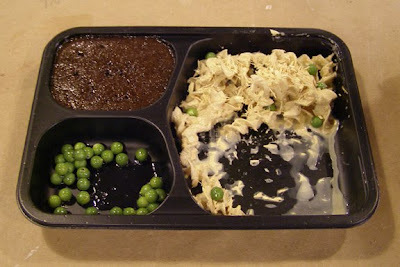 Our shopper, Pete was kind enough to buy me a real TV dinner, so that I could use the iconic black divided tray. I dispatched the dinner, and washed out the tray. The peas were easy as pie. Easy as peas? Hmm. I simply took a strand of cheap mardi gras beads, spray painted them green, cut them apart, and glued them into the tray with Alene's Jewel It glue. This glue is excellent for holding round items to smooth surfaces and, as it dries shiny, I also spread it around the compartment to simulate water. Mmm...watery peas. The tuna noodle casserole is actually sawdust noodle casserole! I mixed up some egg noodles (dry, not cooked) with sawdust, flex glue, a dab of ecru acrylic paint, and a few of those mardi gras peas. The benefit of the flex glue sauce is that it holds the pasta down on its own. I sprinkled a bit more sawdust on top for extra texture. The gooey chocolate brownie was a bonus. I happened to have a few tablespoons of Smooth-On Flex Foam it left over from a previous project. Using Smooth-On's So Strong brown pigment, I colored the foam, and poured it into the tray. Once it was all together, I glued a fork in, and we sent it to stage! Easy peasy! Come on Anna, I'm disappointed that you didn't get that one. Oh, indeed! Hats off to you, sir. How much would you charge to replicate this? Probably around 50 dollars- less per piece if someone wanted more than one.